it is very different: whereas the caudal margin of this bone bears two pairs of rather shallow incisions in modern ibises, there is only a single pair of very deep ones in Rhynchaeites (Mayr 2002d). As in the case of the long-legged Presbyornis (whose sternum resembles that of crown group Threskiornithidae) and the short-legged Anatidae (whose sternum is more similar to that of Rhynchaeites), these differences in sternum morphology may be due to the fact that the fossil taxon had much shorter legs than extant ibises (see Sect. 6.4.3). The coracoid still exhibits a plesio-morphic, cup-like articulation facet for the scapula. As also noted by Peters (1983), Actiornis anglicus Lydekker, 1891 from the late Eocene (MP 17; Mlikovsky 2002) of England, whose identification as an ibis has been doubted by Olson (1981), was probably correctly assigned to the Threskiornithidae by Harrison and Walker (1976a). 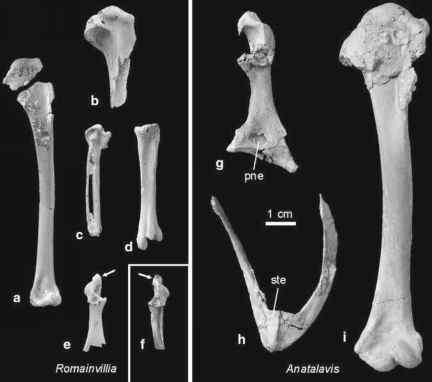 At least a humerus referred to this species closely matches the humerus of extant ibises (Fig. 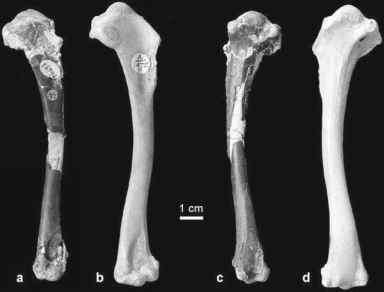 7.9) and is quite different from the humerus of the Palaelodidae (contra Olson 1981). A postcranial skeleton of a representative of the Threskiornithidae was described by Roux (2002) from the early Oligocene of Cereste in France. This unnamed species also exhibits a proportionally shorter tarsometatarsus than modern ibises. 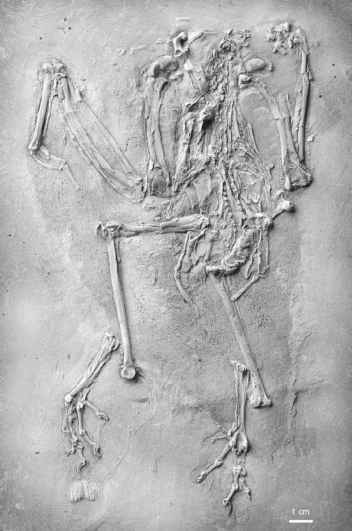 Close comparisons between this fossil and the roughly contemporaneous but slightly larger Actiornis anglicus still have to be performed. of this bone is not possible and that there is a possibility that it belongs to the Geranoididae or Eogruidae (Sect. 9.3). Jadwiszczak et al. (2008) published a note on an ibis-like partial beak from the late Eocene of Seymour Island, but univocal identification of this specimen also has to await the discovery of more material.